The GPac™ wall mounted air conditioners with gas heat are ideal for schools, modular buildings, or any other facility with significant heating demands. 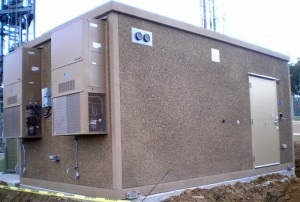 The packaged units are built in cooling capacities from 2 to 5 tons and with heating capacities of 45,000 to 125,000 BTUHs. The standard units operate with natural gas, but can be easily converted in the field to operate with LP gas. All GPac units are available with a full range of ventilation options from a manual damper to the Marvair GreenWheel™ energy recovery ventilator. The GPac units feature high cooling efficiencies with EER’s of up to 10.00 (certified performance according to AHRI standard 390.) The Annual Fuel Heating Efficiency (AFUE) of the GPac units is 80.0. The patented tubular heat exchanger optimizes heat transfer with an integrated formed dimple turbulator and is quieter than other conventional heat exchanges due to its internal baffles. The patented inshot burners fire in a direct line and cross light from burner to burner for immediate lighting. A direct spark ignition eliminates the pilot light. LEDs identify operating status and simplifies service calls.